In 1920s Berlin, suicidal asylum patient Anna Anderson claims to be Anastasia Romanov, the supposedly dead daughter of the last tsar of Russia, Nicholas II, who was dethroned and murdered by the communists along with his entire immediate family during the Russian Revolution. She is so convincing in her descriptions of her life on the court and how she escaped the communist purge that, after leaving the asylum, she slowly gains followers willing to believe her story. However, the surviving members of the Romanov family who now live in exile are not among them. This skepticism soon turns into mutual animosity. Clara (madwoman): My name is Clara. There are a lot of crazy people around here. But I'm not one of them. I'm exactly like you. 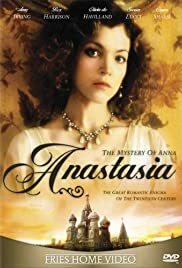 This is a richly produced, atmospheric telling of the Anastasia legend set against the time of the Russian revolution. It has the look of an authentic, handsome movie of the kind made during the golden age of Hollywood. In the title role, Amy Irving gives what is probably one of the finest performances of her career. Others around her are equally impressive: Rex Harrison, Olivia de Havilland, Claire Bloom, Omar Shariff, Jan Niklas and Susan Lucci. The epic story begins with the start of the revolution and the exile of the family of Nicolas and Alexandra. After fleeing execution, the story follows Anastasia's years of struggle to regain her royal heritage--and the opposition of forces around her who call her an imposter. Winner of two Emmy Awards, two Golden Globe Awards and much acclaim from critics and public upon its video showing in 1986. Well worth viewing.